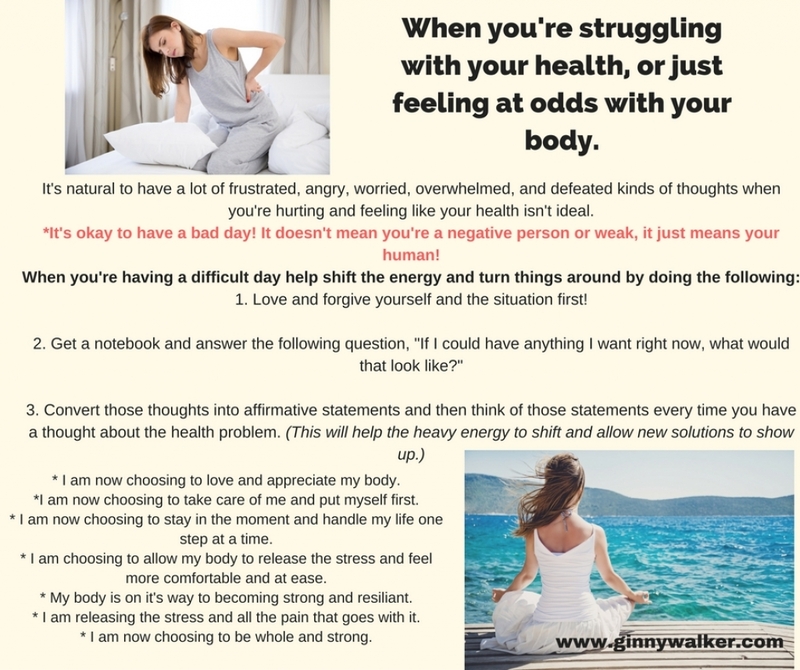 Chronic health issues can mess with you so much! They can make you feel defeated, worn down and like "Why bother!" If you look too far ahead, it can be easy to fall into spiraling thoughts like, "It will never be better than this, I give up, If it's never going to be better than this, I'm done." This can lock you into a really scary place creating feelings of depression and hopelessness. That being said, figuring out how to stay in the moment can be a huge challenge when everything hurts! So if you're feeling at odds with your body, hang in there! Hopefully new solutions and better feelings are on their way. Here's a simple process designed to help you love and take care of yourself when you're having a bad day. Do you enjoy this kind of information? If so, click here to join my Facebook group, Smile Again, Creating an Extraordinary Life.